A 6/6 with swampwalk will occasionally find itself up against a Black Mage who chose Doom Blade as his removal of choice, and just knock them out of the game before they can even register that a big ugly bug witch is wailing on them. But even if Sheoldred never swings, she can put away games. You drop her, and say go. Unless your opponent can kill her at the end of your turn, his upkeep rolls around and he sacrifices a creature. Now, he might untap, draw a kill spell, and just off that thing right then and there, but he still lost a creature and a kill spell-- a 2-for-1. And if your opponent fails to do so, on your turn Sheoldred brings one of your guys back to play. Now, even if your opponent kills Sheoldred in combat, there's still the little matter of whatever you reanimated. Hopefully it was something good that you discarded earlier for that very purpose, but even if it was just a Blistergrub, Sheoldred's dividends are growing. Every turn that goes by, your opponent loses another creature, and you reanimate another one. His army dwindles while yours is rebuilt. The whole affair is about as Phyrexian as it gets. To me, New Phyrexia is more interesting than old Phyrexia, as it has evolved along all five axes of the color wheel and is much more diverse and complex. 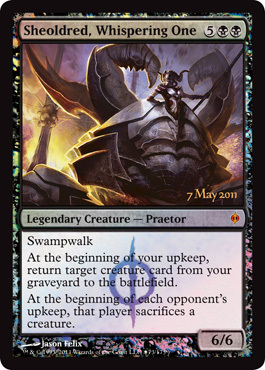 Having said that, the first Praetor we're examining is the one representing Phyrexia's more traditional alignment. Sheoldred is terrifying to basically any opponent who plays creatures, and just as terrifying to anyone who tries to kill your creatures. She also occupies a special niche, ironically alongside Reya Dawnbringer, as a reanimation target who reanimates allies herself. I expect her to be adopted in casual play right away, and perhaps in constructed play further down the line. Today's card of the day is Sheoldred, Whispering One which is a seven mana 6/6 legendary with Swampwalk that returns creatures from your graveyard to play and has each opponent sacrifice a creature during their turns. The cost is high, but this is a really powerful card and has no hidden penalty preventing it from being brought in through another card's effect. The Swampwalk would almost be negligible aside from Evil Presence being reprinted in the same set giving a slightly inefficient option for unblockable damage. The other two effects are pure card advantage with the second being impressively so in Multiplayer. Mono-Black sacrifice would have no shortage of creatures in the graveyard and is likely to benefit from the additional sacrifice made during the opponent's upkeep as well. Overall a truly impressive endgame threat for Black that quickly changes the condition of the battlefield and justifies the high cost. For Limited this a major bomb that is manageable for most decks as it only has two Black in the casting cost. It should be very difficult to remove with six toughness and the Legendary status is unlikely to be a penalty in the format. The card advantage it offers and potential for Swampwalk to be beneficial, especially if Evil Presence is drafted, makes it a number one pick in Booster and clear choice for Sealed builds barring extreme circumstances. Welcome to yet another awesome preview from New Phyrexia here at Pojo.com. Today we take a look at Sheoldred, Whispering One. Sheoldred is one of the Legendary Praetors. Sheoldred happens to be the black Praetor, and one of my favorite Praetors. For seven mana, five generic and two black, Sheoldred, Whispering One hit’s the board. Sheoldred is a 6/6 with swamp walk, and some other nasty abilities. At the beginning of your upkeep, return target creature from your graveyard to the battlefield, and at the beginning of each opponents upkeep, they sacrifice a creature. Now that is how a legendary creature should operate. So much power, and only for seven mana. Theoretically able to be pulled off on turn one, more commonly able to happen on turn three. That would be two Dark rituals and another swamp. Regardless of how Sheoldred ends up on the board, once there it becomes a different game. The fact that now you can sacrifice creatures and not worry, since it comes back, means cards like Lord of the Pit and Xathrid Demon have limitless ammunition. Not to mention that her second ability will have your opponents resources gradually depleting. Definitely worth the mana, as Sheoldred has several ways to exploit her abilities. And what is best about Sheoldred? You can score a free one! How you may be asking? By finding and going to your local Prerelease event for New Phyrexia! That’s right, Sheoldred is the promotional card for participating at a New Phyrexia Prerelease. So make sure you get your hands on the alternate art foil Sheoldred, Whispering One, next weekend, May 7th and 8th.